Harassment on the job is stressful and could be illegal. Your boss yells and screams every time something doesn’t suit him. Maybe a few of your co-workers delight in making snarky comments, or perhaps one of your clients is so demanding that you can’t seem to please him. You are stressed to the point that you've looked into filing a complaint, but it turns out that legally, a “hostile work environment” is not the same as a workplace that is often hostile. There are no laws specifically dealing with a hostile work environment. However, several federal anti-discrimination laws -- the Civil Rights Act, the Age Discrimination in Employment Act, the Americans with Disabilities Act, and the Genetic Information Nondiscrimination Act among them -- cover work environments where employees are subject to discriminatory harassment. In order to rise to the level of illegal action, the hostile work environment must result when workers are harassed or bullied based on their status as one of the groups protected by federal law. Thus, victims could have a legal cause of action if they have been harassed because of their race, color, gender, age, religion, national origin, disability or genetics. Everyone occasionally blows off steam at work. Such temper tantrums are not illegal. Harassment must be proven to be intentional; it must be severe; and it must happen often enough to interfere with the subject’s ability to perform her job. Even witnesses to the harassment could be legally protected. If the victims of the harassment have been putting up with it because they're convinced that they have to endure it or else risk losing their jobs, they have a legal complaint. 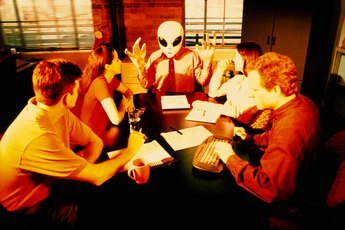 The United States Equal Employment Opportunity Commission defines unlawful conduct as creating “a work environment that would be intimidating, hostile, or offensive to reasonable people.” An occasional off-color joke would not be considered illegal; a repeated pattern of offensive jokes, especially if they are directed at specific individuals, would be regarded as harassment. 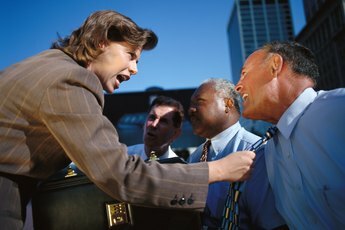 Other conduct contributing to a legally hostile work environment could be name-calling and insults, threats or physical assaults. The harasser can be a superior, a co-worker or even someone who is not employed by the company, such as a client or vendor. Employers must set up policies that clearly define harassment and discrimination and that outline procedures for reporting complaints. An employee who has been subjected to harassment should document each incident with dates, times, description, what was said and by whom, and the names of witnesses, if any. Then she must report the incidents, following the company’s procedures. Generally, the complaint should go first to the employee’s immediate supervisor, unless he is the source of the abuse. If in-house complaints don’t solve the problem, the employee can file a Charge of Discrimination with the EEOC or a similar state agency. The employee must file this complaint before she can sue. A complaint filed with the EEOC could go to mediation or could be passed on to an investigator. The EEOC looks at what occurred and the context while deciding if the action is severe or pervasive enough to be against the law. If the EEOC doesn’t find any violation, the employee is free to file a lawsuit. If the EEOC does find that a violation has occurred, the agency attempts to reach a settlement with the employer. The court, or the agency investigating the complaint, must decide if the offense is minor or if it qualifies as contributing to a hostile environment. The investigation will look at how often the behavior occurred, how the victim and witnesses reacted, and whether the conduct described would be intimidating or offensive to reasonable people. Seattle Business: When Does a Workplace Qualify as Being Hostile? Can a Boss Throw Something at an Employee?